Xin Chao, my name is Dinh from Hanoi Vietnam. After graduated from university in 1996, I started working for many different hospitality services including hotels, restaurants and touring companies such as Dragon Travel, Sea Born Spirit Cruise, Asian Trails and Destination of Asia. I received training to be a tour leader for Peregrine Adventures and Exodus UK to lead group throughout country. Winter 2005, I decided to establish a travel company focus on private tour to Vietnam, Cambodia and Laos destination and name it ‘Jewel Tours’ in order to deliver to customers the Jewel of South East Asia. Hi there, just call me Huy. I was born in Hanoi and have experiences a lot of different job before deciding to stay with Jewel Tours since 2008. I love perfection and enjoy the details in everything that is why I am a quite fastidious worker. Being a Tour Operator allows me to widen my knowledge of the Tourism industry in South East Asia and in particularly that of Vietnam. Xin Chao, I am Sam, the Development Manager. 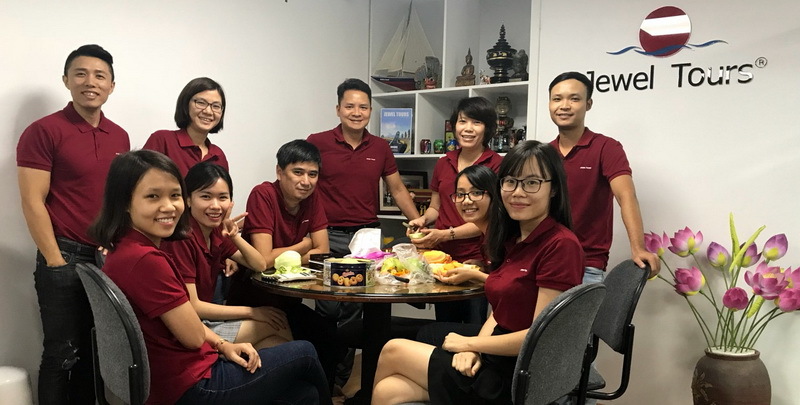 I am the man in the middle, the helping hand of everyone in the company, and due to the friendly, professional and dynamic working environment in Jewel Tours I can do my job perfectly. I would love to accompany you on your path to discover the beauty of the countries and its people from charming Vietnam, Laos, Cambodia to the mysterious Myanmar and the hospitality of Thailand. Join with me to create new ideas, moments and more memorable trips for both ourselves and our friends. Xin Chao, my name is Thuy from Hanoi, Vietnam. I am a financial officer at Jewel Tours. I started my first job as an accountant at a stated owned company, right after I graduated from the University of Finance in 1996. With 10 years of working experience at different financial positions at this company, I wanted to challenge myself in an international environment in order to further improve my skills. I decided to join Jewel Tours for a new journey in 2005, and after a few years of working here I found it to be a brilliant place, not only my job, but the people I work with as well. Together we travel around the world which I enjoy very much, and to combine it with a job I have experience with further increased the enjoyment I have at this company. Hello. My name is Thu. I am a Travel Consultant at Jewel Tours. I began working in the tourism industry in 2017. It is as a way to nurture my own passion for travel. With my experience in the field, I am confident in my ability to provide guests with expert advice, great recommendations and smooth travel experiences. I take great pleasure in creating unique travel experiences that are customized to allow each of my clients to embark on a journey they will remember for many years to come. Welcome to Jewel Tours, and let us design your dream vacations for you! Xin chao! My name is Hue. I am a Travel Consultant at Jewel Tours simply travelling is my desire since high school. I love to explore the new destinations and experience the rhythm of life. I have been working at hotels, travel agency right after graduated from Faculty of Tourism in 2011 and traveled to most of corner in Vietnam, Laos and Cambodia. I am assure to create traveler the most interesting program to explore our authentic destinations. I highly appreciate all of your comments during and after the any trip which will help to improve my experience as well as enhance services for our next customers. Welcome you to Vietnam – the destination with hospitable and friendly people. My name is Nhung and I live in Hanoi. I graduated from Hanoi Open University with the major in tourism. I got 2 years experience about hospitality industry and now I am working as travel consultant for Jewel Tour Company. I love this job due to I will get widen knowledge of the Tourism industry and get the chance to communicate with many people in the world. Xin Chao. My name is Long, an accountant at Jewel Tours. Travel has been always a great passion in my life, which has inspired me to work in this field. I am very lucky work at Jewel Tours, where I have the opportunity to work with professional staff in a great work environment. Also, working at Jewel Tours offers gives mea lot of exciting travel experiences, so I like it here. Xin chao, My name is Tuyền (Daisy), I was born and growth in Long Xuyen Mekong delta. Since tourism is fast developing, in 2010 I decided to challenge myself to be an English speaking guide. I have been showing clients about my home town and surround as a freelance till I found a foot at Jewel Tours with a friendly and enthusiasm team to expose my travel inspiration not only as a tour guide but customer services in South Vietnam and suggest new tours, accommodations and restaurants to help Jewel tour team improve more and more quality of our services. I love my job because it creates opportunities for me to see the beautiful world outside. And Jewel tour team shows me the hospitality, professional behavior and responsibility in every services. Our criteria is make you- our valuable clients feel your are at home when you are in Viet Nam with our sincerity from bottom of heart.